so funny. that hero arts ink looks way better than memento. i always thought my memento was black, but no way! thanks for the tip. Thanks for the comparison, I think I'll try the HA if you can use Copics and watercolor with it. 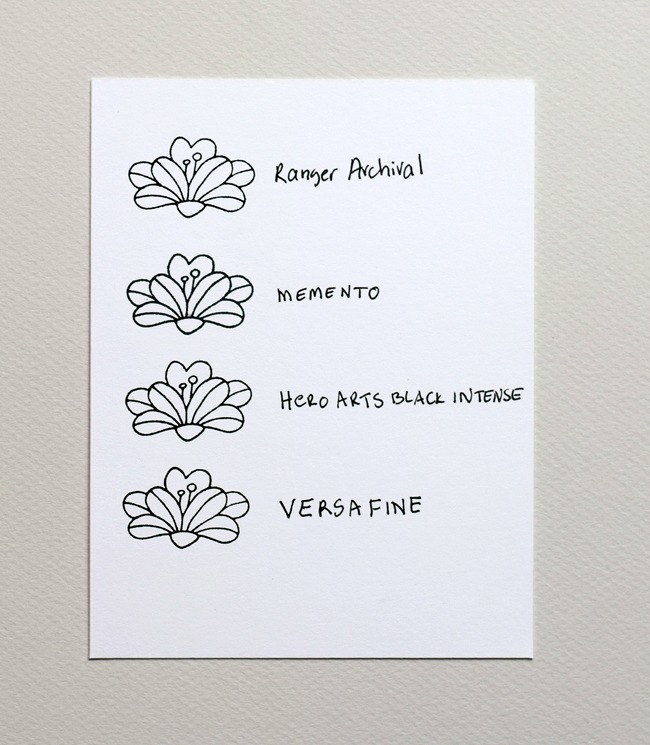 I love my Versafine Onyx for sentiments, and I use either Memento or MFT Hybrid for Copic, although I sometimes get bleeding with them and I don't know if it's the ink or the paper I'm using. Great comparison chart, Joan. I've started using my Versafine for everything, even though I can't stand that it stains my stamps. I don't have copics, but it doesn't bleed with the zig brush pens either. Interesting comparison. I bought the HA intense black as so many were raving about it. However my experience is that my HA ink pad stamps lighter than Memento, which in turn, stamps out similar to your sample. Sigh - still looking for the perfect all purpose black. I do love VersaFine, but of course it can't be used with every coloring medium. Thanks again for your info and inspiration. I have not. Can you describe its uses? That is and always has been my favorite black ink. I use it almost exclusively. I use it with watercolor. It's a really dark black. Good comparison Joan. I find inking with two separate brands using the MISTI gives the results I'm happy with. Usually Momento Tuxedo and SSS Black Premium Dye ink. My personal experience is that Memento is darker than the HA intense. I have been using the Simon says intense black ink. I think that it works very well. It works great with copics. I've been using the Memento for ages, but will give the Hero Arts a try when I am next able to place any kind of order. gotta give props for crisp! since I watercolor everything, I need something that doesn't bleed. Love this comparison. Can't remember ever having such a fun time reading the pros and cons!! Seriously, though, I totally agree that individual results vary HUGELY with inks. I love my Memento Luxe, but VersaFine never, ever gave me good results. When my Memento tuxedo black pad was new, I loved it, but now that I've reinked it several times, it doesn't give nearly as good results. And that's just for black inks. Throw colors into the mix, and things get even weirder. Some colors of ink work better than others...in the same company's line. You have convinced me to try the HA intense black. We shall see. I really want an improvement on the Memento now, especially seeing the color difference on your chart. Thanks for posting this! I am so glad you did this ink comparison! I have all of these black inks (obsessed crafter? Ummmmm YES) and you beat me to my own comparison. Thanks for sharing and love your witty commentary as always, Joan! Thanks so much, the HA ink sounds like a good option for Copics especially because it is a 'good' black. I've been using the Memento Tuxedo as I did try the MFT, but didn't like the stamped results although I hear that they have changed the formula now... But my all time fave of blacks is the Versafine Onyx for sure. I truly appreciate your doing this comparison. It is vert helpful, and so good to know how they do compare! Kudos and many thanks to you for doing this! Brilliant article. Really made me chuckle. I've only used two of these inks. Some people rave over memento black when colouring with alcohol pens but I don't find its a clear line image at all. I love black versafine for everything. HOWEVER I do love memento coloured ink pads they're my fave! Versafine is my go to for sentiments or if I need a solid black image. I use Ranger Archival for watercoloring, but I only have gray and ochre. I don't have a MISTI. Memento for Copics. Some feel it's waterproof, and it may not run or bleed, but seems to me it fades under water. I don't have Hero Arts black, but I'll look for it locally. Really appreciate this honest comparison, Joan. Thanks for doing this comparison! I would love to see a couple others compared to these too, like Gina K Black Onyx and the Lawn Fawn Black Licorice. I know neither of those would be Copic friendly, but there are times you just *need* a good black and other folks rave about these. I prefer Archival when I need it to be dark, but I use Versafine for sentiments, especially when detailed or tiny. Very curious though, what brought your Versafine out of detention? Or why do you get along with it better now? the first 20 or so times I used it (I kept sampling) it was not clear at all. It was a mess and I was so frustrated. But I guess it had too much ink on it because I blotted it very gently with a paper towel (I just have the cube) and I am now very happy with it. I use Ranger Archival and VersaFine a lot! I use The Ton Caviar when I need to color with Copic markers. Memento didn't give crisp images like I wanted! Thank you for the comparison! This is very helpful. BTW, I am now following your blog which I just found tonight thru the Hero Arts Blog Hop. I just had to stop hopping to read more posts and let you know how much I have enjoyed reading it! Great post - thanks for the information. 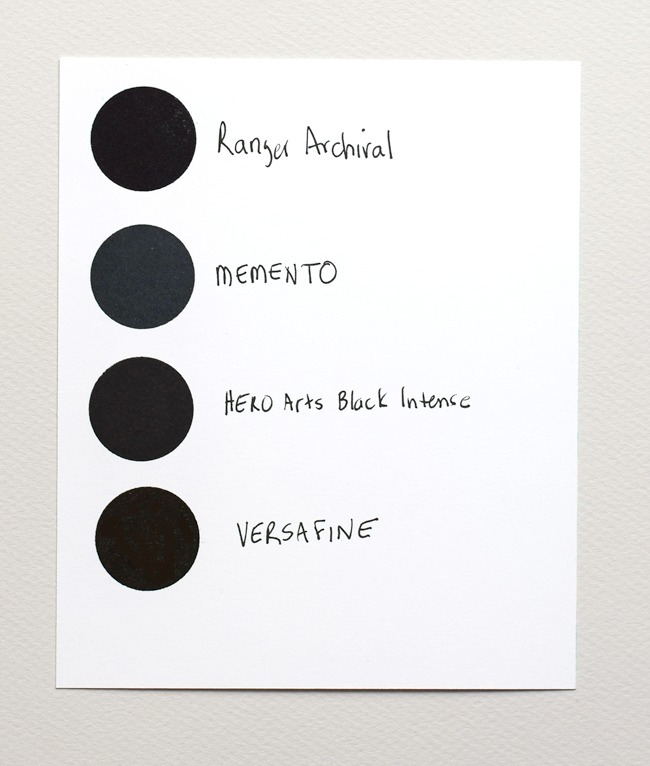 I did have a Ranger Archival which I loaned to a friend for a church project...it never came back to me....I use Brilliance Graphite Black but my go to black is alway Versafine Onyx - never fails. I'd like to try the HA one though. As for the Presidential thingy...not that I understand all the nuances thereof being across the pond but glad 'you know who' has been somewhat scuppered. I'm definitely going to try the new HA Intense Black, but I'm also wondering if anyone has tried the SSS Intense Black? How do they compare to MFTS Hybrid Black? I think everyone is searching for that stamping holy grail of the perfect black ink! Thanks for the comparison... I'll probably pass on the Hero Arts Intense Black. I already have a number of black ink pads and use them variably depending on their properties and the project. I'm a VersaFine Onyx kind of gal but haven't tried Hero Arts. Sounds intriguing. Great comparisons, Joan! Thank you soooo much!! I have spent days googling what ink can I use instead of Memento coz I hate that the lines are ragged, great that you can use it with copics but horrible lines!! I will give Hero Arts Intense Black a bash!! My Versafine Onyx pad is still over-juicy after more than 15 years, so good to hear that Hero Arts could be a contender. Thanks for the comparison!